TonerGreen Eco-Friendly Brother TN-450 Toner Cartridge for Brother HL-2220 | TonerGreen - Eco-Friendly Toners from the U.S.
TonerGreen is an environmentally-concious online store that has been providing environmentally responsible printing solutions such as eco-friendly toner cartridges and eco-friendly ink cartridges for popular printer brands like Brother. We have a wide selection of eco-friendly remanufactured Brother toner cartridges for DCP Series, MFC Series, HL Series, Fax Series and IntelliFax Series. 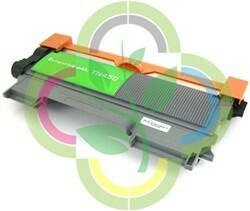 Tonergreen recognizes the need for replacement toner cartridges for Brother printers and MFCs. Thus, we offer an extensive selection of reliable and, most of all, environment-friendly remanufactured Brother toner cartridges. We understand that you cannot neglect your need to print just because you're on a tight budget. Our high quality toner cartridges for Brother machine are guaranteed to work smoothly and deliver the same performance as that of original toners. Included in their wide array of Brother toners is the Brother TN-450 toner cartridge ($26.00) for Brother HL2220 and Brother HL2230 laser printers. TonerGreen is driven by our steadfast commitment to consumer satisfaction. We deploy substantial resources in ensuring the durability of our toner cartridges. Each toner cartridge comes with 2 Year warranty. Moreover, we assure you that using our toner cartridge will not void your printer warranty. TonerGreen takes pride in the superior performance of our products compare to the average compatible or remanufactured cartridges found on the internet, this is because quality is strictly imposed every step of the remanufacturing process until our products are picked up by the customers or shipped to their address. Our products are not just ordinary recycled toner cartridges because recycling is just a small part of the meticulous remanufacturing process that our products undergoes, we make sure that they will live up to your expectation while being eco-friendly at the same time.